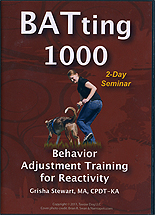 This two-day seminar on Behavior Adjustment Training, filmed in Chicago, will give you an in-depth look at how to use BAT for fearful, aggressive, or frustrated dogs. It covers body language, how to arrange set-ups, variations, sudden environmental contrast, fighting within the home, how to use BAT on a walk, tips on fence-fighting, and preventative use of BAT with puppies and new dogs. Live demos, video clips of case studies, verbal explanations, and visual aides help you see how to put this effective technique into action. Grisha answers practical questions that you might have about BAT in language that's technical enough for trainers, but still clear enough for regular dog lovers.